Fall cocktails don’t get much more seasonal than these Cranberry Whiskey Sours! I’m always envious of my neighbors who pull off such beautiful fall displays on their front porches. Hay bales, woven corn stalks, mums, pumpkins and gourds…they look amazing. My front step is graced with my straggly, sad-looking summer flowers that really need to be put out of their misery. So while my seasonal decorating skills may not rate very high, my cocktails skills are totally on point, and these Cranberry Whiskey Sours are just begging for you to share them with family and friends this fall. 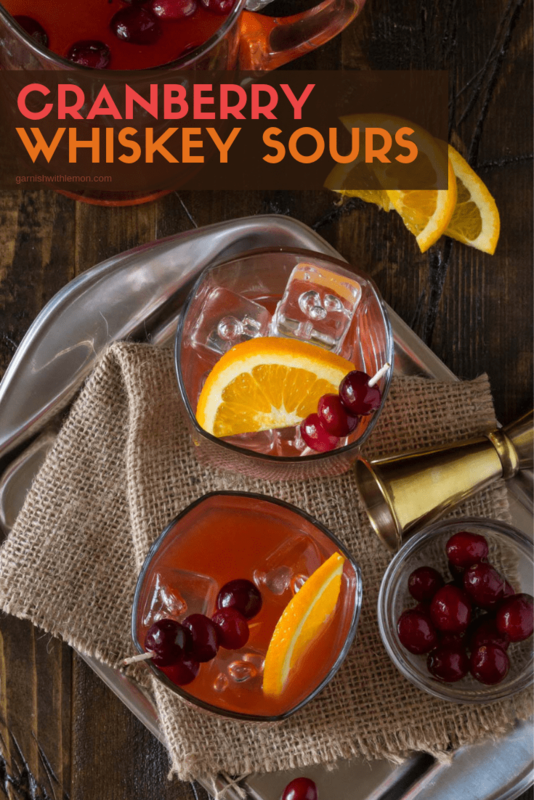 These Cranberry Whiskey Sours were inspired by another of our most popular batch cocktail recipes, Meyer Lemon Whiskey Sours. It’s not quite meyer lemon season yet, but it’s definitely cranberry time, so stock up on a few bags while you’re at the store. Tip: An easy cranberry-infused simple syrup is the base of this drink. Make the simple syrup ahead of time; it will keep in the fridge for about a week. Because cranberries are naturally tart themselves, the typical lemon and lime juice “sour” has been replaced with an ample amount of freshly squeezed orange juice as well as a bit of lemon juice. The smoother flavor of the orange juice is the perfect complement to the tart cranberries. A healthy pour of fall’s favorite tipple, whiskey, is the finishing touch to these rosy-hued Cranberry Whiskey Sours. You can certainly make just one of these beauties after a long day, but we prefer to serve them batch style when we have guests over. Stir all the ingredients together in a pitcher and chill until party time. Garnish your Cranberry Whiskey Sours with more fresh cranberries and orange slices for an inviting and tasty welcome to fall – no froufrou hay bales or pumpkin carving skills required. 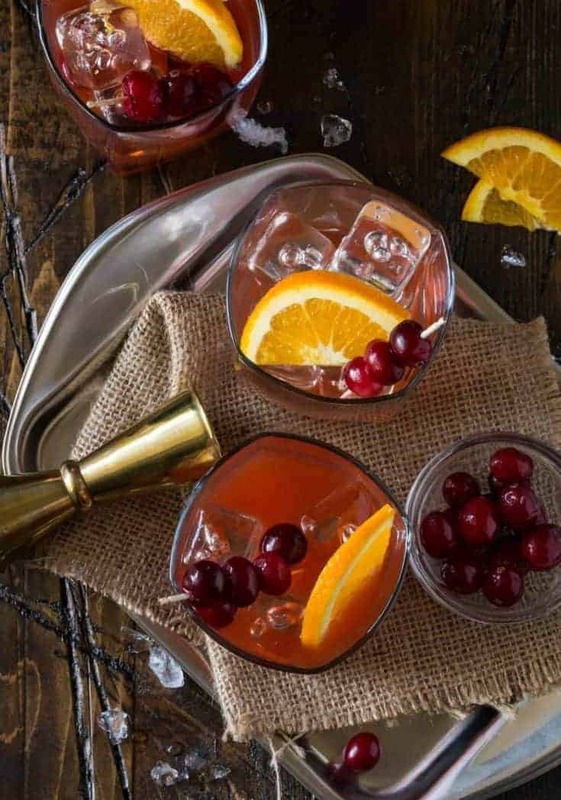 Add some new ideas to your fall cocktail repertoire with some of our favorites below! 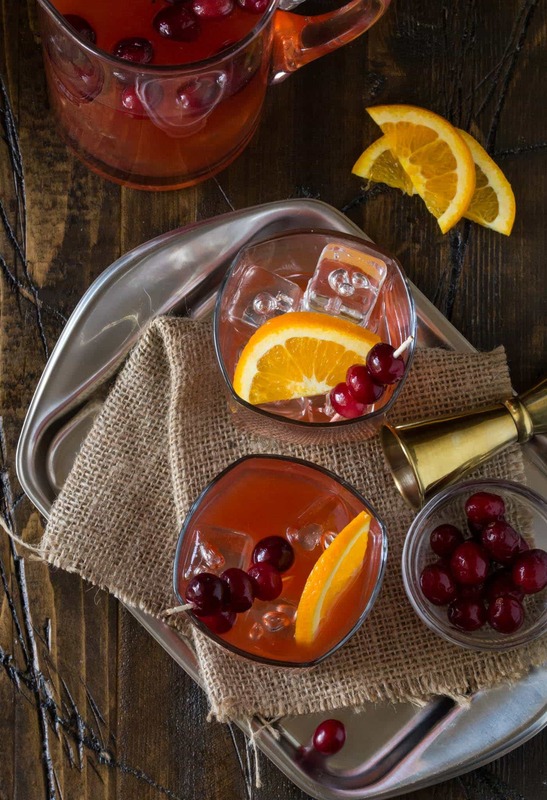 Cocktails don't get much more seasonal than these Cranberry Whiskey Sours. Place sugar, water, and cranberries in a medium saucepan. Heat over medium heat until mixture starts to boil and sugar is completely dissolved, stirring occasionally. Remove from heat and steep for 10-15 minutes. Strain through a fine mesh strainer and cool completely before storing in the refrigerator. Place cranberry simple syrup, whiskey and juices in a pitcher. Stir to combine. Pour into ice-filled lowball glasses and garnish with cranberries and orange slices, if desired. The cranberry simple syrup makes about 1-1/4 cup of syrup and will keep for about a week in the fridge.